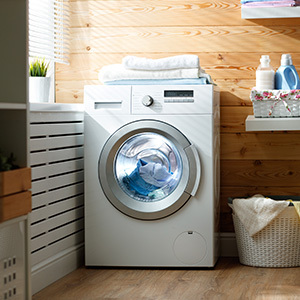 The laundry room is one of the most utilized rooms in your home next to the kitchen — find tips and techniques to maximize the space to make your household run more smoothly. Along with common adulting chores is doing and keeping on top of the laundry, and if you have a larger household, that is no easy feat! 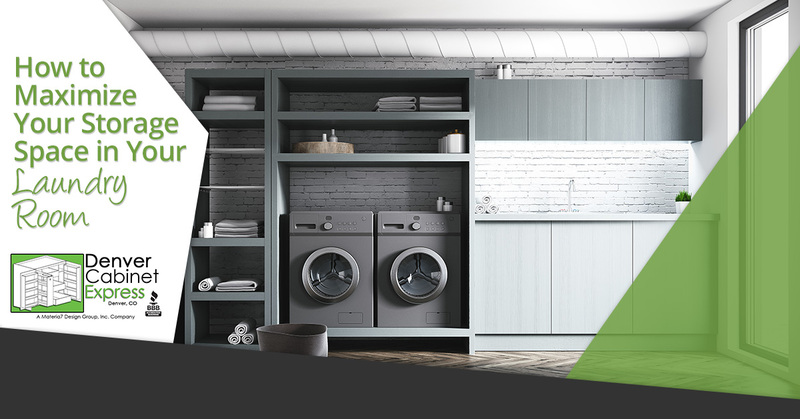 The laundry room is the perfect space to add RTA cabinets to maximize and optimize your storage and organization capabilities. At Denver Cabinet Express, we furnish the best RTA cabinets in the industry that are both stylish and long-lasting. Join us in today’s post as we examine tips and techniques to get the most storage space in your laundry room. If your laundry room only has a washer and dryer in it, it has the perfect opportunity for more RTA cabinet storage — there is so much blank space that can be added for you store laundry accouterments and more! If you have front loading appliances, you can add upper cabinets and even create cabinet space next to them — add a countertop and sink and you have a luxury laundry space! You are even able to add a variety of RTA cabinet styles on the walls opposite the washer and dryer that are taller and more of a pantry style that can hold non-perishable food, cleaning supplies, and appliances. Your laundry room has the potential to be a refuge and not a disorganized nightmare. Create a multi-purpose laundry space - Your laundry room can be much more than space to ditch your dirty laundry, it could be transformed into a multi-purpose space where you could add a tub that duels as a space to give your dog baths, it could be a craft room, or even an all-purpose room where you add a deep freezer and do some food prep. The laundry room can double as a command center that accommodates your family on a daily basis in many different ways. Create a stylish, yet functional space - Many think that just because it’s a laundry room you can skimp on style, but this is so far from the truth. While you don’t have to invest a large amount of money in this space, the nicer it looks, the more you’ll enjoy being in there. Choose a nice soothing paint color — blues, greens, and greys are great — and focus on the details. Opt for beautifully furnished RTA cabinets and even add a backsplash to your sink — it is the small things that create a better ambiance that feels good to be in. Add a design aesthetic - It’s important to incorporate pieces that make the area more livable — add a cozy, comfy book nook or a comfortable desk and chair you can work at while you wait for your laundry. Implement candles and fresh flowers and make it as functional as possible, while adding unique touches. Is your laundry room a dead space? Freshen it up with some RTA cabinets and personal style — make it a room that is relaxing! Partner with us today and start designing your ultimate laundry room space! Connect with us today to find a style and color for your home.